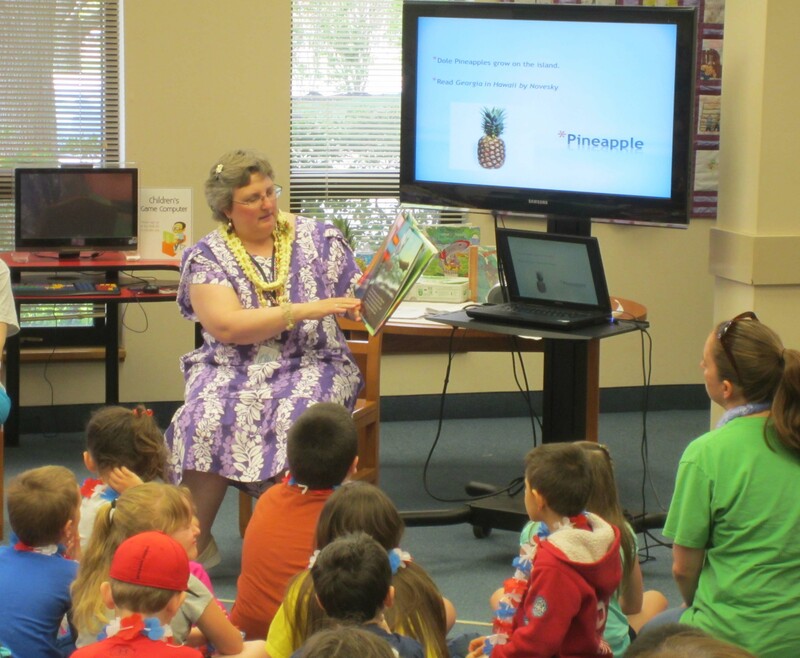 Donna Majchrzak presented a Hawaiian Celebration at the Little Egg Harbor Library Wednesday, May 13 to 46 special needs students and approximately 30 adults. Donna created a PowerPoint presentation that included pictures of a Hawaiian pineapple, rainbows, erupting volcanoes and coconut trees. Donna explained the pictures, passed around two coconuts and held up one pineapple for all the children to feel and see. The PowerPoint presentation also included Hawaiian words and pictures for the fish “ama ama” and Hukilau, a traditional dance. Everyone stood up and learned the dance along with the YouTube version of Hukilau from St. Michael’s Community in Hawaii. At the end everyone designed their own surfboards on white oak paper. Every student and adult had received a lei when they arrived at the branch. The leis were sponsored by the Friends of Little Egg Harbor Library. Judith Krall Russo served up tea at the Little Egg Harbor branch. 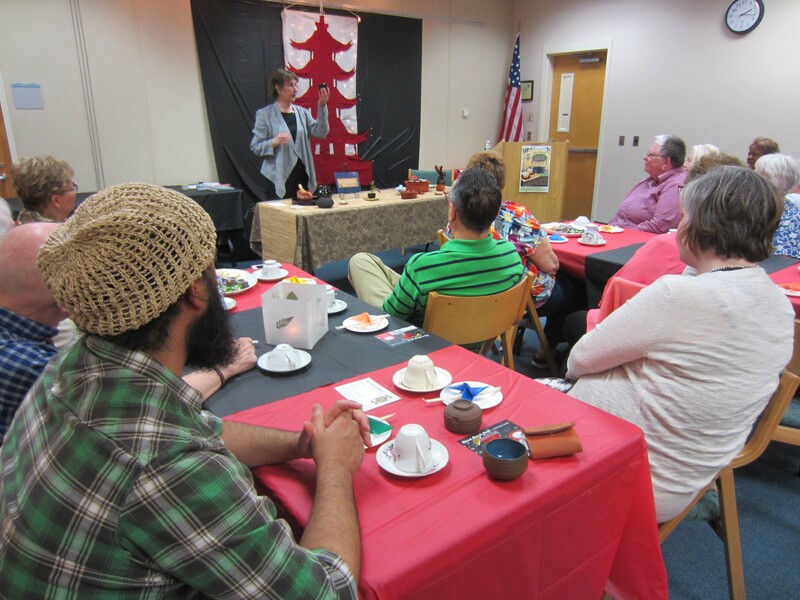 Thirty-nine people attended the Asian Tea program at the Little Egg Harbor branch Saturday, May 2nd. While guests tasted Japanese sweets using chop sticks [nori cookies, sesame bars, sour apple candies, sugar glazed rice cookies and mochi], costumed presenter Judith Krall Russo described a Japanese tea ceremony where matcha tea was heated, whisked, then served to guests in disposable espresso cups. A Chinese tea ceremony followed with two types of tea and almond pocky, or fortune cookies, for tasting. Thanks to the Friends of the Little Egg Harbor branch for providing the program and refreshments from the Asian Supermarket in Pleasantville, to SerendipiTea for the Oolong and Genmachi teas, Habitat for Humanity for the loan of tea cups and pots, Lisa Ferrara’s TAB young adults for the butterfly origami at each place setting, and Pinelands Regional Junior High School students for the book display cranes in nests and flowers in boats origami. Patrons were pleased with the program, taste testing, book display and chance to exchange experiences. At least six adults joined the Friends! 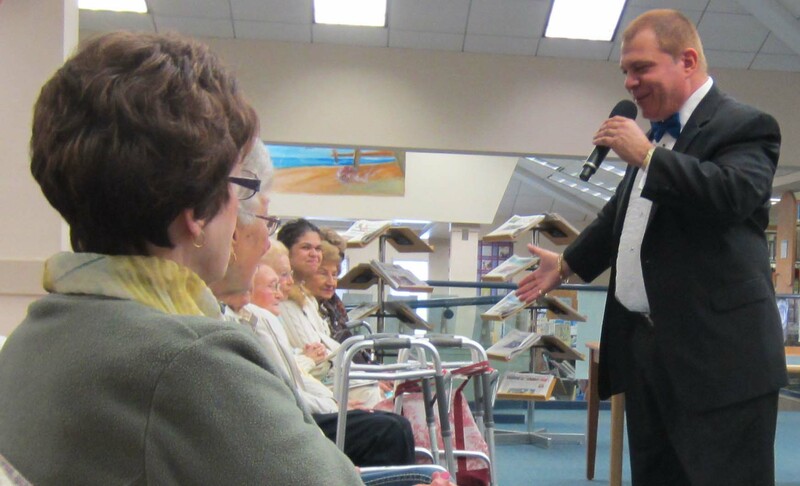 Dave Deluca drew in a crowd of 80 Frank Sinatra fans for the Friends of the Little Egg Harbor Library General Membership Meeting on Tuesday. Little Egg Harbor Township Police Detective Maino was also on hand to tell audience members about the Portable Medicine Drop Box. TOMS RIVER – The New York City-based BALAM Dance Theatre will present an evening of martial arts and dance 6 p.m. Tuesday May 5 at the Little Egg Harbor library branch, 290 Mathistown Rd. The dance company’s artistic director Carlos Fittante and principal dancer Toshinori Hamada will perform in traditional costumes. The BALAM Dance Theatre joins diverse dances and historical periods from around the world with the opulence and aura of Balinese theatre. It appeals to audiences of all ages and backgrounds. Its artistry and movement fused with athletic and detailed skills are enhanced by eclectic music, striking masks, vibrant costumes and fantasy stories. “El Vito,” a Spanish Escuela Bolera dance solo celebrating the allure of the bullfighter. 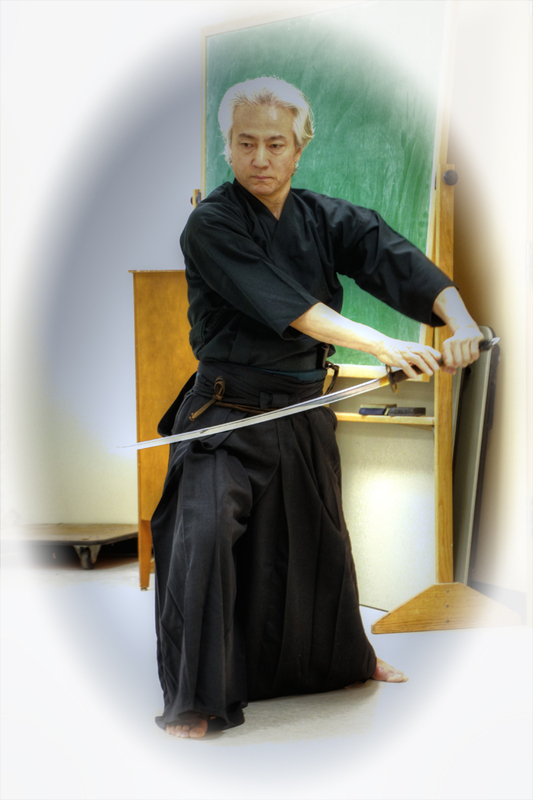 They will also present a special feature, a demonstration of Iaido, a Japanese wood sword technique, with audience participation. Toshinori Hamada will perform with the BALAM Theatre Company May 5 at the Little Egg Harbor branch. The programs is free and open to the public but registration is required. To register telephone the branch 609-294-1197 or go to the library Web site: www.theoceancountylibrary.org , click on the “Events & News” icon, then click on “Calendar of Events.” Registration begins April 6. TOMS RIVER – The Little Egg Harbor branch of Ocean County Library, 290 Mathistown Rd., will host Volunteer Lawyers for Justice: Disaster Response Program 10 a.m. to noon during Mondays in December. The volunteer group will help people determine if they have legal issues that arose because of Superstorm Sandy. Based upon those determinations the group can offer free legal counsel and brief services. Contact Garima Joshi for more information at gjoshi@vljnj.org or (862) 229-4550. Walk-ins are welcome. Mortgages and recent mortgage statements. 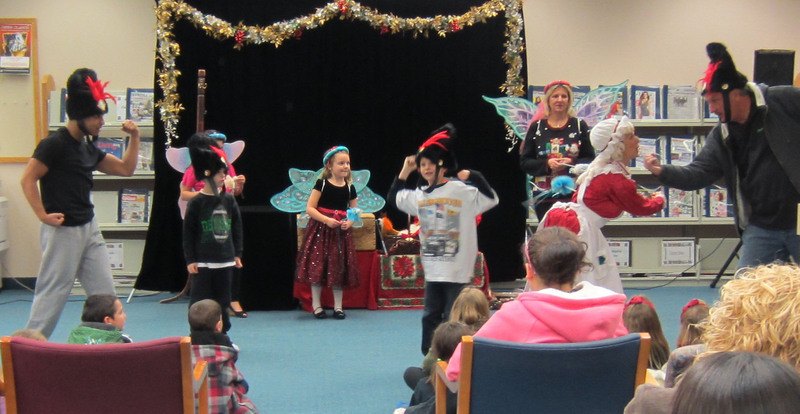 The Kitty Jones Interactive Theatre performed Mrs. Claus Holiday Celebration at the Little Egg Harbor Library Thursday Dec. 8. The interactive holiday show featured many of the audience members as part of the show. President of T.A.B. Hadeel and Vice President Abdullah, along with fellow T.A.B. members Marcus and Chris, were Sugar Plums. Many of the children and adults also participated in other roles dancing and singing throughout the play. Everyone was filled with the holiday spirit and enjoyed participating and watching the performance.